Atomica Gallery is proud to present Fauxmance, the second solo exhibition from British artist and illustrator Jack Pearce. 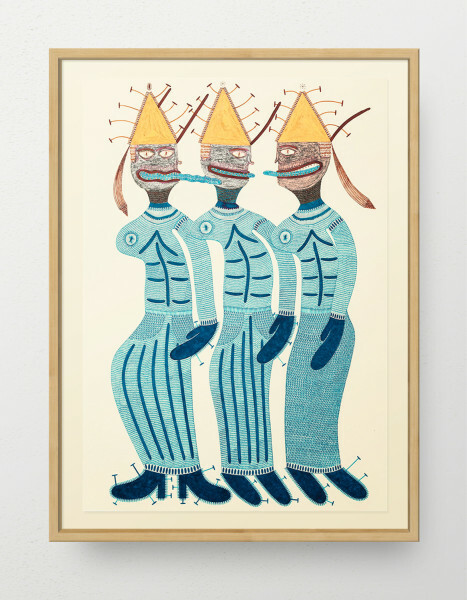 Fauxmance follows Pearce’s successful debut solo exhibition Bromance at Atomica Gallery in 2013 and marks a clear development in the artist’s work both in subject matter and technique. Pearce is one of a new generation of young contemporary artists who have grown up influenced by skate culture and the ethics and spirit it has encouraged. Pearce has recently been commissioned by the legendary Ed Templeton to produce a board graphic for his iconic skate brand Toy Machine, due to be released later this month. With a knack for creating captivating long limbed and loose lipped characters that demand closer contemplation, Pearce has spent the last few years developing his skills and technique to present a new series of 12 A1 sized works for Fauxmance. Physically entangled and seemingly united by a sense of joyful abandon, Pearce’s new ‘Fauxmance’ tribe have an androgynous quality with complex and menacing dynamics at play. An extremely exciting talent whose work has already been noticed by collectors and first-time art buyers alike, Pearce’s Fauxmance is a must see exhibition of 2015. Please contact sales@atomicagallery.com for all sales enquires or for more information regarding the exhibition or artist.